When Does It Make Sense to Buy an International SIM Card? Most people get confused and make hasty decisions when they are about to travel; this is true especially when it comes to staying in touch with loved ones. Many of us often go for roaming on our local SIM cards, but that is expensive and unpractical in some situations. Although local SIM cards are an ideal choice for short-term travelers and local people, they are not suited for globe-trotters, business persons, and long vacationers. International SIM cards or travel SIM cards allow you to use your smartphone all over the world. Unlike a local SIM which uses your present mobile network carrier, international SIM cards aren’t bound to any particular carrier. They use different mobile networks in various countries that are supported by the SIM card. 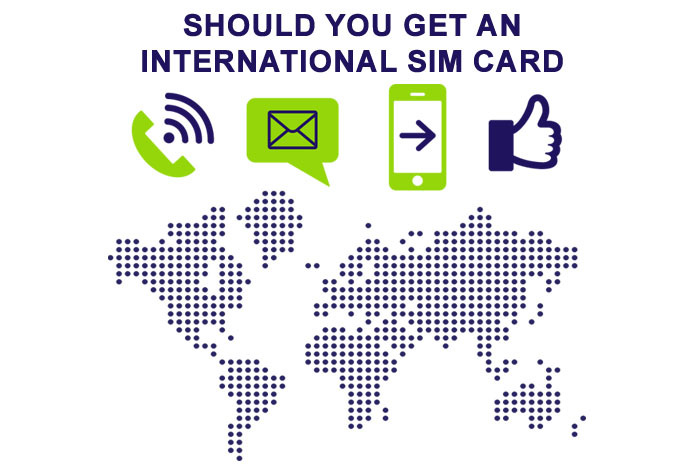 Should I Buy an International SIM Card? Whether or not you should buy an international SIM card depends upon many factors. Of course, it all comes down to your personal preferences as well and as such, there are not fixed rules to who should buy this type of SIM and who shouldn’t. Generally speaking, you should buy an international SIM card if the following cases are applicable to you. Note: to use an international SIM card, your device must be unlocked. Click here to learn more on "How to Unlock Your Phone to Use an International SIM Card". Business Person: Business persons often take several important business trips throughout the year, going from country to country on short trips. Most of these trips last for only a few days. Since time is money, it is a better idea to purchase an international SIM card if you fall under this category. This is because roaming on your local SIM card would be far more expensive and less convenient. Additionally, you don’t want to be buying the local SIM of the country since you will only be there for a very short period of time. Frequent Flyers: Individuals who are fond of traveling and going for long vacations should consider buying an international SIM card. Such persons have a home base and they travel mostly for leisure. If you are one of them, you don’t want the hassle of locating mobile stores in every country you touch down in order to purchase the local SIM. Sometimes, you might need to call home immediately, call a taxi service, etc. and in such situations, having a working SIM card at hand is not only convenient, but timesaving as well. Furthermore, frequent flyers love the notion of saving their unused minutes on international SIM cards for their next trip. People on a Budget: As mentioned earlier, traveling with roaming enabled on your local SIM incurs unnecessary and extra costs in your phone’s monthly bill. These costs can easily rack up when you are on the go. Some carriers can charge up to $4.99 per minute of outbound calls. Now this is extravagant indeed! If you are traveling on a budget, go for an international SIM card. They are cheap as compared to roaming and incurred charges are lower. iPhone users can learn which iPhone models will work with an international SIM card here. Wraptel offers international SIM cards that offer low cost data, talk, and text capabilities in over 200 countries around the globe. For a limited time, Wraptel is giving away its international prepaid SIM card for free; click here to get yours.